Free For All received a sample to facilitate this review all opinions are 100 percent my own no financial compensation was received! My kids have had the most fun ever I can not get them in the house and for my two who always seem to have an electronic of some kind in their hand that is saying something. We have bounced to the moon and back in our Big Ol Bouncer from Blast Zone and we love it! I feel like a kid again myself. I have also lost almost 20 pounds and gained so much muscle it is amazing. I even feel healthier! Kids are meant to be active and this is a great way to get them out and moving. 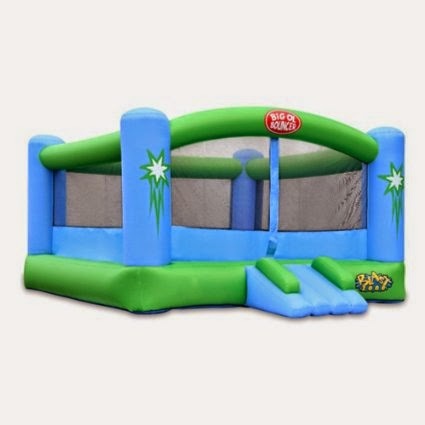 Blast Zone offers many different household and commercial inflatables. 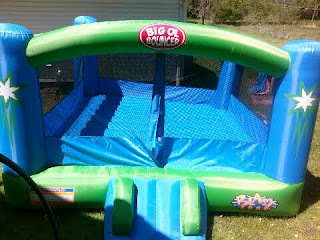 See all of the newest bounce houses Blast Zone has for sale http://www.blastzone.com/shop/pc/Bounce-Houses-c2.htm and for anyone interested in the commercial inflatable products please visit: http://www.blastzonecommercial.com. 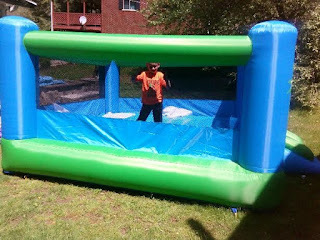 With all the heat be sure to check out Blast Zone's Inflatable Water Parks visit: http://www.blastzone.com/shop/pc/Inflatable-Water-Parks-c3.htm and cool down the fun way! It took us less than 5 minutes to get our Big Ol Bounce House up and inflated. There is really nothing to it you stake it down kind of like how you would a tent and then make sure the 2 areas that allow air in and out are secured. When blowing up the Big Ol Bounce House you tie off the deflating area so air stays in and you tie the blow up area to the blower and plug it in and viola your Big Ol Bounce House inflates in less than 2 minutes right before your eyes. The kids got a kick out of it and loved how fast it blew up! I love all of Blast Zone's products and have never been dissatisfied we own 2 bounce houses and the Hydro Rush Water Park and they have been well worth every penny! After reviewing the Big Ol Bouncer this year and the Hydro Rush last year I can safely say that Blast Zone has the best inflatable water parks and bounce houses in the industry. Blast Zone has agreed to give all of our readers a 10% discount off all bounce houses now through May 2015. Blast Zone site does not currently have coupon functionality so you will have to call in and use the code BOUNCEBLOG to save the 10 percent. Make sure you are following Blast Zone on all their social media channels below and be sure to like and share all the amazing summer fun you are having with them!